My travel buddy Hamilton currently resides in bonny Edinburgh, so I flew solo to Warsaw Chopin Airport from London Heathrow. We thought we were super organised and had arranged to arrive at the airport within 15 minutes of each other, but upon arrival we realised we were in different airports; Hamilton was at Modlin, about 45 minutes out of the city, and I was at Chopin, a quick 15 minute drive from our hotel. TIP: if you are flying separate, make sure you know where you are going! I ended up arriving at the hotel an hour ahead of Hamilton so of course cracked open a bottle of Pilsner, I was on holiday after all! My flight was supposed to be about £90 but due to me spending all my money on the British Airways Avios eStore, I managed to save an excellent £30! This was the cheapest flight I could find, as it was half-term week here in the UK. I would recommend checking out the BA Avios eStore as they have a lot of retailers featured and you earn a certain number of Avios per £1 spent, which you can then use toward your future trips! 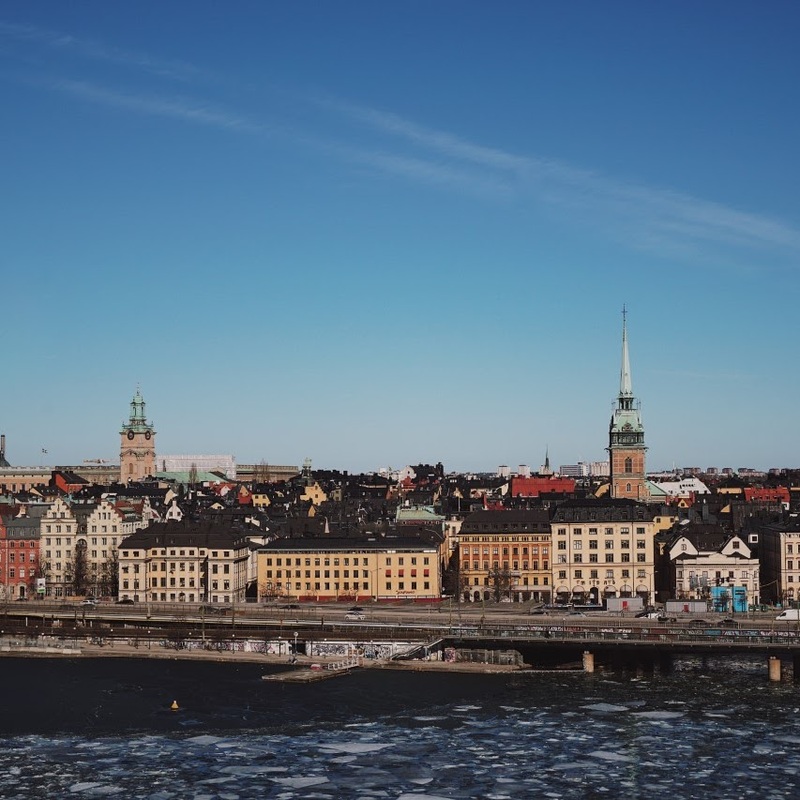 After our glorious time at the Radisson Blu in Stockholm, we booked to stay at the Radisson Blu Centrum. For a 5 star hotel in a capital city, the hotel was very reasonably priced and the room was really spacious and comfortable. However I would not have thought it was 5 star, it did not feel 5 star at all and after the shower head blew off and hit me in the face, I'd have to give the hotel a 3.5/5. Once we had been reunited after our airport debacle, we set out to explore... One of Hamilton's best travel qualities is he is excellent at directions, I even likened him to the droid L3 from Solo, the new Star Wars film, as he has the best navigational mind. For both days he mapped a route for us to make the most of our short time in Warsaw. 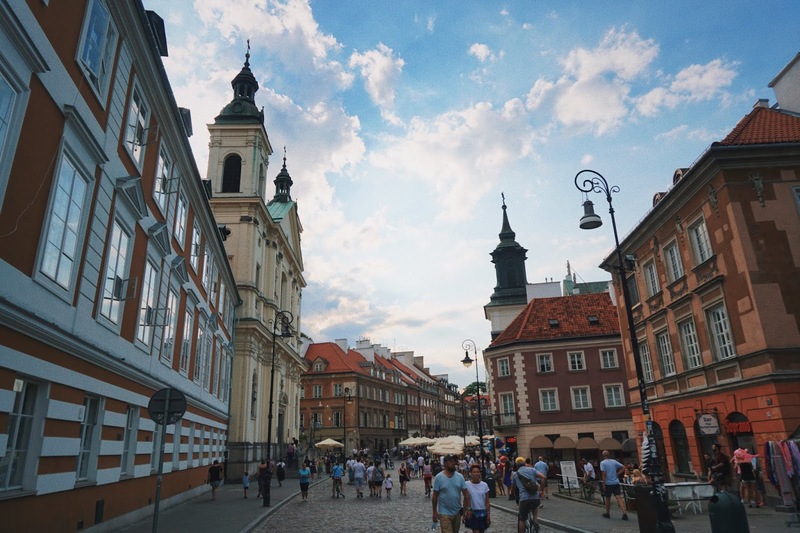 Our first day saw us heading toward the Old Town, or Stare Miasto in Polish, and from our hotel we walked through the Saxon Garden, made a quick stop at the Presidential Palace, gazed at a couple of churches and then arrived at Castle Square. The square, home to the Royal Castle, is so beautiful. It is such a vibrant place, full of colourful buildings and little restaurants. I half expected it to be crowded and a little unbearable, similarly to Prague's Old Town square, but it was lovely. We sat on some steps, taking it all in before grabbing a beer and a bite to eat, with a gorgeous view of the castle. I loved wandering the Old Town, exploring the side streets, seeing St Johns ArchCathedral and the Jesuit Church. We also headed to the Old Town Market Place, an Instagrammer's dream. Everywhere you turn, there are an array of different colour buildings lining the square, and I loved the hustle and bustle of the locals and tourists going about their day or enjoying a drink in the sunshine. It was really delicious and I tried to eat it all, but it was impossible. There are loads of little ice-cream hatches around the Old Town - the perfect treat for when you're wandering the city in the summer heat. After throwing the remainder of my ice-cream in the bin, we walked to the Warsaw Barbican on the edge of the New Town. Considering it would have been used for defensive purposes in the war, it was beautiful and very popular. I've a newfound love for red-brick buildings, the Warsaw Barbican included. After getting caught up in a Corpus Christi procession in the New Town Market Place, we decided to check out some more architecture and headed to the Krasinski Palace, complete with some Pegasus sculptures in the front garden, and to the Museum of the History of Polish Jews, a stunning building that was sadly closed for the day but that I hope to go back to as the museum is meant to be really interesting. The next morning, we set out early to make the most of our only full day in Warsaw. Our hotel was quite near to the Palace of Culture & Science, a stunning example of Stalinist architecture and Poland's tallest building, so we stopped by to admire it in the sunshine. It reminded me a lot of New York's art deco high-rise buildings. After grabbing a quick breakfast, we headed to the Czapski Palace. We discovered on this trip that Warsaw loves a palace, they are everywhere and they are BEAUTIFUL. After admiring the Holy Cross Church, we wandered through the University campus to the Copernicus Science Institute, another museum that is on my list for when I return. Warsaw absolutely nailed architecture, I've never fallen in love with so many buildings so quickly. We were both very keen to go to the Neon Museum, but upon realising that there was no way we were walking the 45 minutes in the boiling sunshine, we decided to hire bicycles. I'd never cycled around a capital city before, but could not recommend it enough for Warsaw. They have bike hire stands all around the city (download the Veturilo app to check locations) and it is super bicycle friendly. When you're wearing a dress in 31 degree heat, increasing the thigh chub-rub risk by a solid 60%, that bicycle breeze is a dream. I love walking a city, but I do often find myself looking at it through my camera lens; cycling was such an eye-opener as I took in so much more of my surroundings. It was really lovely and cheap as chips! We cycled through Praga, the up-and-coming trendy district, full of character and history. We passed buildings where you could still see the bullet holes from the war, graffiti murals and edgy bars. The Neon Museum, essentially a neon sign graveyard, was really cool. It contained signs from (I believe) the 1950s - 1970s. The gallery, housed inside an old warehouse, was small but I would recommend a visit! After a quick pit-stop for a beverage, we cycled through Skaryszewski Park to El Krepel, a little cafe that I will talk more about later on. We then headed to the stunning Lazienki Park, home to a gorgeous palace, statues, a botanical garden and more. I hope to go back here as we only caught a glimpse of it - you could spend a day here exploring the museums and galleries, being amongst nature, seeing the beautiful palace, sitting with a book and an ice-cream. Sounds like heaven right? Seeing as we enjoyed our cycle to Praga so much, we picked up some more bikes and cycled back to the Palace of Culture & Science. The building has an observation terrace so our last stop of the day was here as the sun started to go down, who doesn't love that golden hour light for their travel photos? Warsaw has a beautiful skyline and the view was great. We then headed back to our hotel, ordered takeaway, and got an early night ready to get the train to Krakow in the morning! I won't go in to too much detail about how I karate-kicked my McDonalds fries across my bed, or my time spent standing outside the hotel at 9pm waiting for Prince from Uber Eats to bring us a greasy burger each, but I will tell you a little about some of the great places we ate at in Warsaw. A couple of days before we left, I ended up on the #warsawfoodie hashtag on Instagram, and was met with photos from two places that looked right up our street; Juice Press People and El Krepel. On our second day, before heading to Czapski Palace, we stopped by Juice Press People for some breakfast. I chose to have their Choco Smoothie Bowl; peanut butter, cocoa, banana and milk, topped with coconut, banana and pomegranate. It was bloody delightful and so filling, the perfect fuel for a day exploring, and only cost 23zl aka £4.70. Hamilton went all-out millennial and had sliced avocado on toast. The cafe had a lovely atmosphere, the guy serving was a babe and the decor was really cool as well. That same day, after we cycled back from the Neon Museum, we popped in to El Krepel. After my awful visit to Elan in London in March, I was a little apprehensive; could this be another cafe that is aesthetically pleasing but has terrible food? I was so wrong! Yes, the cafe is gorgeous, the decor is beautiful and it's not as OTT as the likes of Elan, but what was even nicer was the staff, the atmosphere and the food. I opted for a pineapple juice and a white chocolate donut (my camera would not focus so I apologise for the poor photo) and Hamilton had the most extra looking meringue dessert. We had our food in reverse and ended with a plate of fries. I know a plate of fries doesn't sound that fancy or interesting, but these were great. I'm not sure what the cheese or seasoning on them or the dip was, but they were so good. I would 10/10 recommend. Another spot that is great if you love dinner with a view is La Dolce Vita on Castle Square. We stopped here on our first day exploring the Old Town as we were both in need of a beer and a pizza, and we sat with gorgeous views of the square and the Royal Castle. The food was great, and I loved how you could be in one of the busiest parts of the city but spend such a small amount on your meal - the pizza was about £8 and the beer was about £2.70. I love all of your pictures! They make everything look so magical! Sounds like ye had a blast. Definitely inspiring me to book a trip! Loved this post! 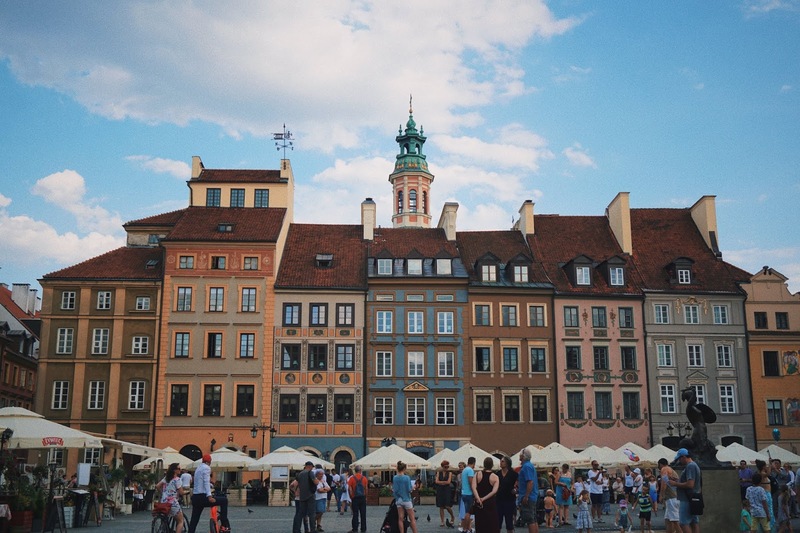 Warsaw has never been on my radar before but it looks amazing from your photos. The buildings are something else �� My workmate is off to Krakow for the third time next week and loves the place. I think I really need to Poland on my to-visit list! The colours of your photos makes me feel like ive seen the place. Great travel post and really informative. What camera did you use? Poland looks beautiful, I'd love to visit one day! Great post!